We are a spa & wellness hotel with a unique family atmosphere and a luxury standard of spa and hotel services. The hotel has more than a hundred-year-old history. We offer a complete spa treatment in an exceptionally equipped balneological center. The stay, that is full of spa treatments, is enhanced by an offer of relaxation services in our wellness center, cardio center, swimming pool, salt cave or beauty parlor. We have summarized all brochures, leaflets and price lists and put them on one page. You can always find them up-to-date and in an interactive form to make going through them more enjoyable. Karlovy Vary belongs to the most beautiful towns in Central Europe. Explore sights, historical buildings, colonnades and also parks and view towers. In the spa center you will feel the atmosphere that has been created by nature over centuries. Do you have an enquiry, do you want to get up-to date special offers or to contact us on social network? Here you can find all the contacts. Lets take a tour through not only our history. You will take a detailed look to the history of Karlovy Vary city. Get to know all local historical buildings, sights, colonades but also with lovely parks, view points. Karlovy Vary are really beautiful city. 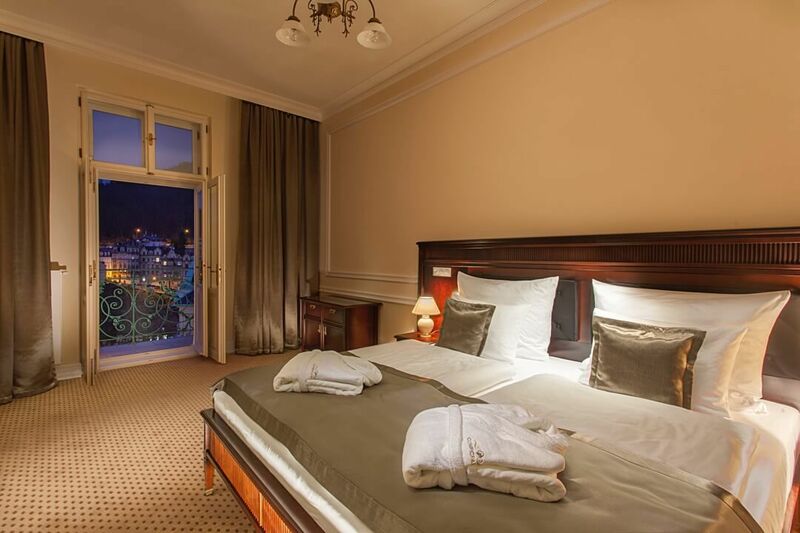 Double rooms are offered in three categories: Double Comfort, Double Superior and Double Deluxe, they mainly differ by their size and furnishing. Two thirds of them have a balcony or a terrace. Our standard spa program is available when the stay is for or longer than 6 nights. At the entrance check-up the doctor sets the extent and composition of treatments. En suite rooms have two separated rooms – a bedroom and a living room. Most of the suites have a balcony or a terrace. Some rooms can have an extra bed, some of them can be connected with other rooms. Are you coming for a short time? Within hotel stays the entrance to a swimming pool, saunas and fitness is free. You will make your stay more varied with advantageous packages. Comfort is luxury. Your luxury. Rooms are situated in two interconnected buildings. you can choose from 58 rooms with AC. 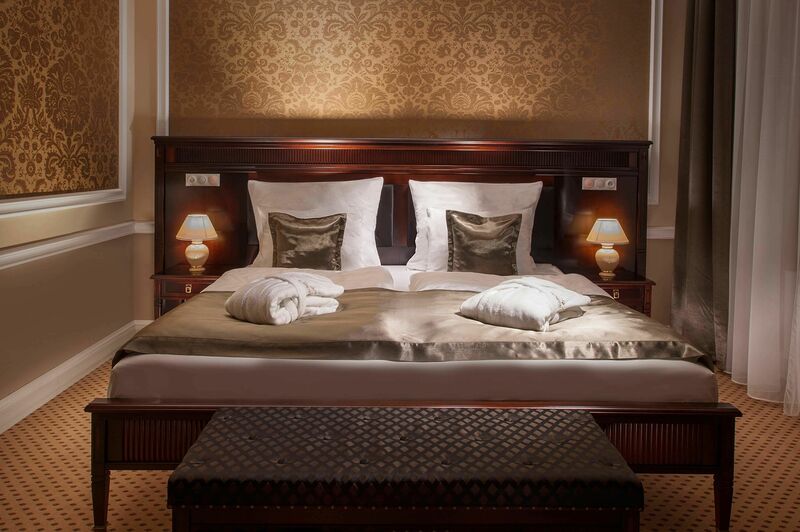 All our rooms are furnished according to international high class of luxury hotels. 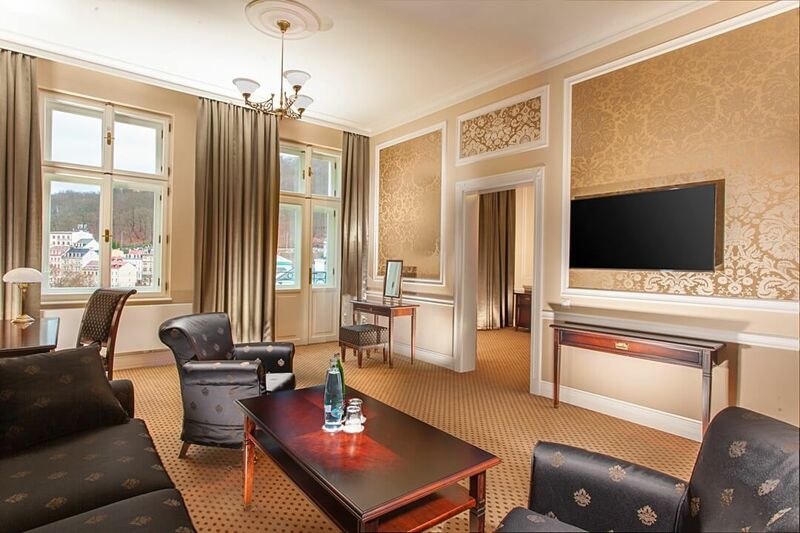 Rooms are offered in two categories – double rooms and suites. Its possible also to connect some of them, we can also arrange an extra bed or baby cot, most of them has a balcony or small terace. 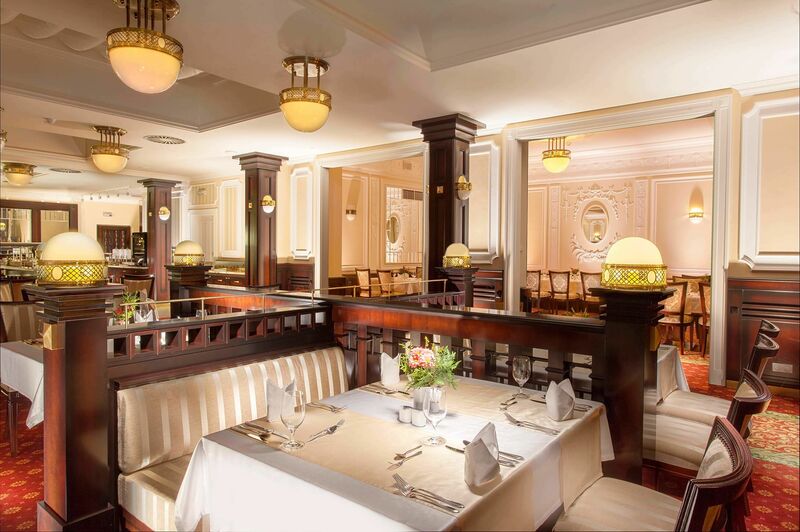 The Restaurant Amadeus will take you to the times when people enjoyed their lives in high style. The hotel catering is in a buffet style. Then, it is up to you what symphony of tastes you will compose and how variable it will be. The basis of our Program of a healthy lifestyle is to show activities and eating style that is also possible to keep in the home environment. 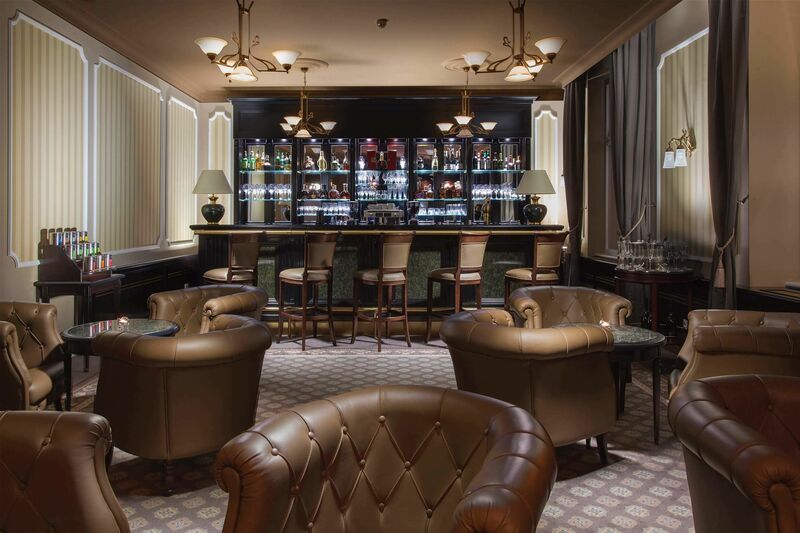 Thanks to its location the lobby bar Sebastian is an ideal place for a friendly meeting or free moments. In the offer you will find selected wines, luxurious loose tea or unique cognac of Rémy Martin Louis XIII. For our smallest quests we, in cooperation with a nutrition therapist, are preparing a special menu. We think about their comfort and safety. Experience the luxury. Your luxury. 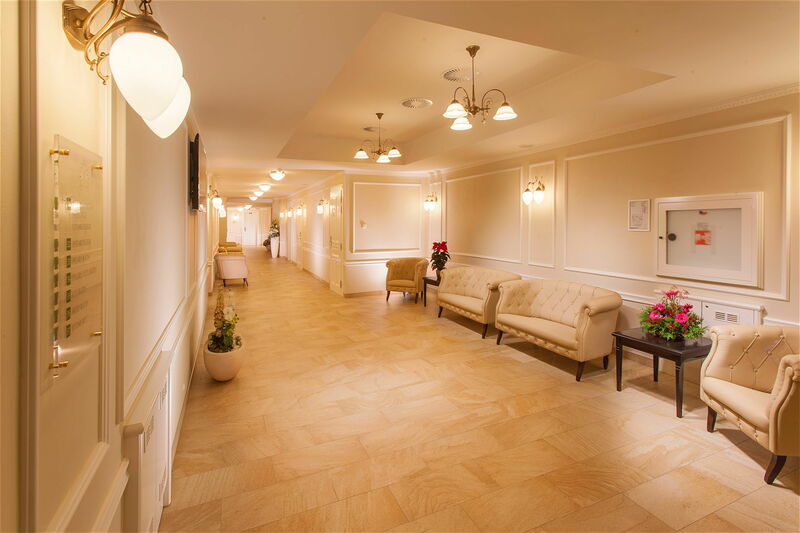 Hera, a modern balneological center is the pride of our hotel. The specialists make for the quests a therapeutic plan from a complete offer of hundreds of treatments. We use curative effects of Karlovy Vary mineral water right in the building. 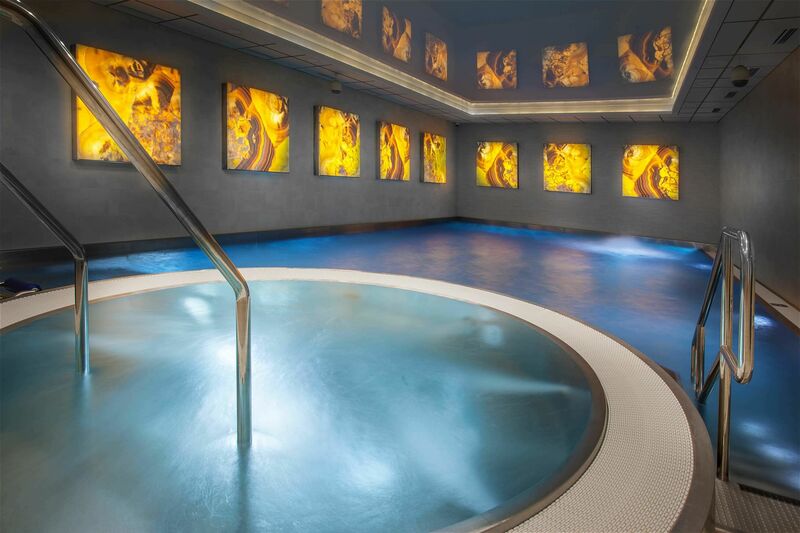 Apollo, a wellness center offers a swimming pool with a few attractions, whirlpool and three different saunas. The whole center is daily available and free for all hotel quests without limits. They can also visit a salt cave. 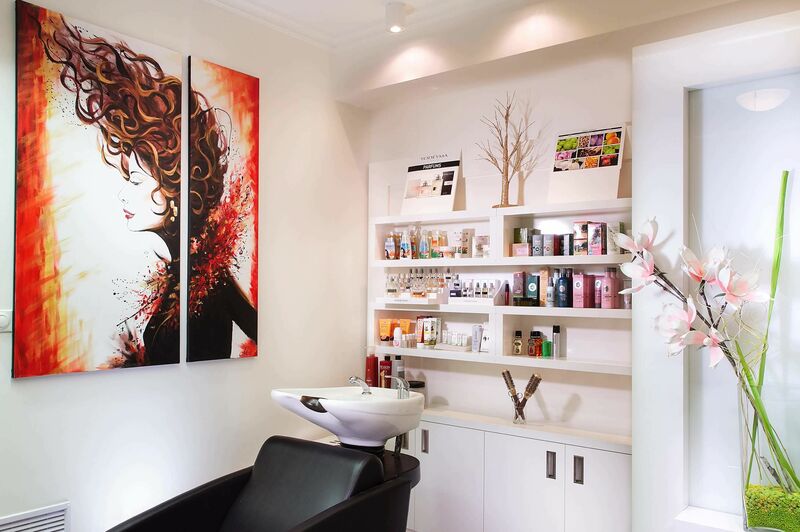 Aphrodité, a parlor, offers services of a professional hairdresser, an experienced beautician and also a manicurist. 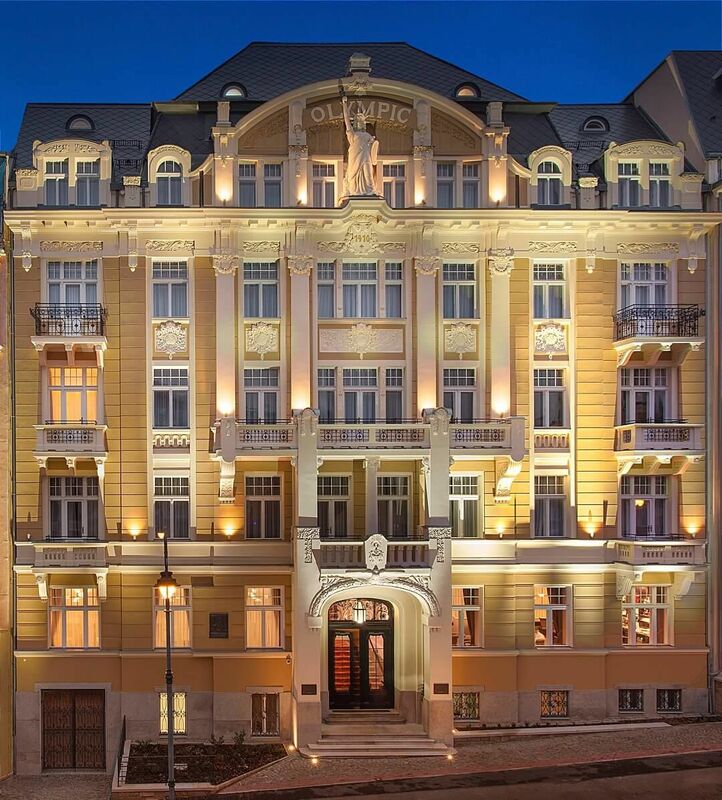 Not only hotel guests but also other visitors to Karlovy Vary can have treatments and also be made more beautiful. We offer to our guests more than 100 various spa and medical treatments that they can choose by themselves or according to the created a plan of treatments. We have prepared for children special treatments, such as a strawberry bath package, salt caves and a swimming pool are also popular. Health is luxury. Your luxury. Hera, a modern balneological center is the pride of our hotel. The specialists make for the quests a therapeutic plan from a complete offer of hundreds of treatments. We use curative effects of Karlovy Vary mineral water right in the building. Hotel guests are free to use our Apollo Wellness Center. Favorite room is salt cave and Aphrodité Beauty.